Australian Quilt Study Groups: Dr Annette Gero talk at the V&A Quilt exhibition in Brisbane on the 20th July 2013. Dr Annette Gero talk at the V&A Quilt exhibition in Brisbane on the 20th July 2013. 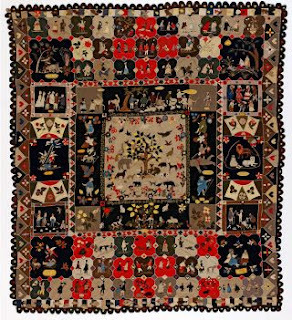 In conjunction with the ‘Quilts 1700 – 1945’ exhibition of quilts from the Victoria and Albert Museum that will be on show at the Queensland Art Gallery in Brisbane from mid June to late September this year, there will be a series of free talks and workshops. Dr Annette Gero, FRSA, will give one of the monthly illustrated talks on Saturday the 20th July 2013. In her talk, titled ‘200 Years of the History of Quilts in Australia’, she will examine the fascinating history of quilting in Australia, comparing the extraordinary British quilts brought to Australia during the colonial period with those featured in ‘Quilts 1700 – 1945’.